DOI : 10.26650/electrica.2018.99730Accordingto clinical symptoms, attention deficit and hyperactivity disorder (ADHD) iscategorized into three groups: the predominantly inattentive subtype (ADHD-I),the predominantly hyperactive-impulsive subtype (ADHD-HI), and the combinedsubtype (ADHD-C). Recent advances in neuroimaging have demonstrated newapproaches for assessing the ADHD subtypes with underlying pathophysiology.This study aims to examine the hemodynamic response and reaction time (RT) inhealthy children and the ADHD subtypes as measured by functional near-infraredspectroscopy (fNIRS) during an auditory oddball attention task. The sample wasmade up of 40 children divided into four groups: control group (n=14), ADHD-Igroup (n=9), ADHD-HI group (n=6), and ADHD-C group (n=11). The target responseswere identified and were grand-averaged for each participant. Right prefrontalcortex hemodynamic responses and groups performances on RT were comparedbetween subtypes and between controls and subtypes. Functional near-infraredspectroscopy indicated that while control subjects exhibited higher activationthan all ADHD subtypes, the ADHD subtypes did not differ from one another.Relative to control subjects, a longer RT was observed in all ADHD subtypes.The ADHD-I group showed significantly longer RTs compared to the ADHD-HI andADHD-C groups. This study can bring a new perspective to the continuingcontroversy about ADHD subtypes, and the findings may help in the evaluation offNIRS, RT, and RT variability studies in ADHD. DOI :10.26650/electrica.2018.12050Alzheimer'sdisease (AD) is a neurodegenerative disease and is identified by the detectionof amyloid-plaques and neuroﬁbrillary tangles in the brain. Amyloid precursorprotein gene, presenilin 1 (PSEN1) gene, and presenilin 2 (PSEN2) gene areresponsible for this disease. PSEN2 and amyloid precursor protein (APP) genemutations are a much rarer cause of familial AD patients. This study aims toclone the PSEN2 gene and create vectors with different mutations by directedmutagenesis. As a result of the experiments, the PSEN2 cDNA was cloned betweenthe BamHI and KpnI cut-off points of the pBluescript II sk (+) vector. PSEN1and PSEN2 homologs have a role in cell destiny decision and AD progress. We studiedsome of the PSEN2 mutations (Ala252Thr and Pro334Arg) and provided expressionanalysis in eukaryotic cell cultures. Amyloid β-protein (Aβ), which is producedby endoproteolytic cleavage of the APP, is considered to play a role in AD.While nominal concentration of Aβ40 is 10 times of Aβ42, the last peptide isfirmly linked to AD pathogenesis. Amyloid β-protein is generated by theγ-secretase cleavage of APP onset and the progression of AD, and it is theprimary ingredient of the senile plaques. The Aβ42 dodecamer plays a centralrole in AD. In future studies, it will be determined if there is an increase inAβ42 protein levels, and the effect on this early onset AD can be identified. DOI : 10.26650/electrica.2018.00998Emotion state detection or emotionrecognition cuts across different disciplines because of the many parametersthat embrace the brain's complex neural structure, signal processing methods,and pattern recognition algorithms. Currently, in addition to classicaltime-frequency methods, emotional state data have been processed viadata-driven methods such as empirical mode decomposition (EMD). Despite itsvarious benefits, EMD has several drawbacks: it is intended for univariatedata; it is prone to mode mixing; and the number of local extrema must beenough before the EMD process can begin. To overcome these problems, this studyemploys a multivariate EMD and its noise-assisted version in the emotionalstate classification of electroencephalogram signals. DOI :10.5152/iujeee.2018.1819Cognitiveradio (CR) technology presents a mechanism for efficient spectrum usage.Spectrum sensing is an essential CR function which includes an intelligentsignal processing algorithm to identify the vacant frequency bands. Cooperativespectrum sensing (CSS) has been widely adopted to improve the performance of CRnetworks. Unfortunately, CR networks are vulnerable to security threats. Inthis study, we propose an optimal threshold selection approach to address oneof the most important attacks called primary user emulation attack (PUEA). InPUEA, a malicious attacker mimics some important primary signal features anddeceives CR sensors to prevent them from accessing the available channels. Inthis study, we assume a malicious PUEA which is relatively located near thepotential user (PU) transmitter and senses the spectrum and accurately detectsthe vacant frequency bands to transmit its fake signal. We estimate attackstrength and then apply the K-out-of-N rule to obtain an optimum and dynamicthreshold K, minimizing the global error probability. Here, the attack strengthis defined as the ratio of the average transmission power of the PUEA to theaverage power of the PU. The achieved simulation results indicate that theperformance of the suggested method is satisfactory in detecting the maliciousPUEA compared with conventional methods. DOI : 10.26650/electrica.2018.001This study presents an efficient approach for determining the optimal locations of wind turbines (WTs) in distribution systems, which considers the existing uncertainties in the power generation of WTs and the load demand of consumers. The daily load profiles of the seasonal and geographical-dependent behaviors of WTs are also considered. The proposed probabilistic approach is based on scenario tree modeling, and each scenario is assessed in regard to power loss minimization. Then, the TOPSIS (technique for order preference by similarity to an ideal solution) method is adopted to regulate the optimal placement of WTs considering the average value and the standard deviation of active power losses as possible attributes. This approach enables a multi-attribute analysis of the search space to yield a more efficient solution. Detailed simulation studies, conducted on IEEE 33-bus test system, are utilized to examine the effectiveness of the proposed method. The results of this study are discussed in depth. DOI : 10.26650/electrica.2018.73966Offshore wind farms inherently need alternating current (AC) grid connection with undersea cables. However, this requires reactive power compensation, which is costly and not practical. Moreover, it threads the stability of the system. For these reasons, high voltage direct current (HVDC) transmission is a promising solution since no reactive power is needed. Furthermore, the DC power flow between offshore and onshore locations as well as the reactive power at either side can easily be controlled by voltage source converters (VSCs). In this paper, the modeling and control of an offshore wind farm connected to the mainland grid power with HVDC transmission is proposed. A control strategy is proposed to control active and reactive power at the offshore wind farm converter and DC voltage at the onshore converter. The overall system, including wind farm, offshore and onshore converters, HVDC transmission, and AC grid side, were tested and verified in a simulation environment. The designed control systems of the VSCs were tested by various case studies. DOI : 10.5152/iujeee.2018.1822Different techniques developed in theprevious decades are used for blood vessel detection. Different kinds of imageprocessing approaches in the detection and analysis of blood vessels can beapplied to diagnose many human diseases and help in various medical and healthdiagnoses. Image processing for blood vessels could be used in areas such asdisease diagnosis, severity measurement of specific diseases, and in biometricsecurity.This study compares two differenttechniques to accurately diagnose a specific disease according to someselective features. Diabetic retinopathy is used for this comparative study asit is one of the most severe eye disorders and chronic diseases to causeblindness. Classifications and accurate measurements for blood vesselabnormalities (exudates, hemorrhages, and micro-aneurysms) enabled the correctand accurate diagnosis in retina and diabetic retinopathy. To avoid blindness,it is essential to utilize fundus image processing application to facilitatethe early discovery of a diseased retinal. Throughout the fundus automatedimage process, the retinal features are extracted. The techniques applied inthis study are a morphological-based image processing technique and an edgedetection technique using Kirsch’s template. First, the application of theseimage processing techniques are described and explained in detail.Subsequently, a classification process is proposed to assess and evaluate theperformance of each technique. DOI : 10.26650/electrica.2018.56722 In this paper, a photonic integrated device fabricated on a silicon-on-insulator (SOI) platform is studied numerically to investigate its hydrogen sensing potential based on intensity variations. A single-slot hybrid structure consisting of a coaxial micro-ring resonator (MRR) and a palladium (Pd) disk is utilized for this purpose. The results of the numerical study reveal a hydrogen sensing ability of 2.83×10-4/(v/v-% hydrogen) and limit of detection (LOD) of 9.93×10-3 which is more than 10 times of that of the hydrogen sensors based on the traditional resonance shift. The proposed hydrogen sensing technique presents a compatible SOI-based technology and also provides a reliable detection of the slightest changes from the zero concentration in an analytical procedure. DOI : 10.26650/electrica.2018.55345Magnetically coupled resonant loops can be represented by a lumped element circuit model. Each parameter in the lumped element model can be expressed as a function of loop geometry and the separation between the loops; therefore, the geometry can be systematically changed, and the power transfer efficiency of the coupled loops can be predicted. This paper presents a simulation-based efficiency analysis for wireless power transfer systems utilizing magnetically coupled resonant loops. The behavior of power transfer efficiency is studied for various loop geometry parameters, and the simulation results are presented in detail. These results clearly show that there is a trade-off between peak efficiency and critical coupling distance, both of which depend on the loop size, frequency of operation, and source-load impedances. To verify the accuracy model, two identical circular loops are fabricated and measured, and the measurement results agree well with the model. DOI :10.5152/iujeee.2018.1824“Tesla’s Egg of Columbus” is the project of Nikola Teslathat proved the existence of rotating field produced by two-phase AC winding in1893. Here in this study, generalised mathematical magnetic field model form-phase “Tesla’s Egg of Columbus” is established with its details. 3-phasemodel of “Tesla’s Egg of Columbus” that is non-existing in the literature isdesigned analytically by means of generalised expressions. Electrical andgeometric quantities are calculated and the system is analysed by Finite ElementsAnalysis (FEA). The designed system is manufactured and tested at rated currentfor constant and variable frequency with eggs made of different materials.Optimised frequency for materials and geometries are obtained and compared. DOI : 10.5152/iujeee.2018.1825The determination of the most economical generation dispatch in an electrical power system has become a very important issue globally. However, economical dispatch can no longer be considered alone because of environmental problems that are derived from emissions such as nitrogen oxide, carbon dioxide, and sulfur dioxide. In this study, the problem of environmental economic load dispatch (EELD) in a power system of six generators is addressed both by neglecting and including line transmission losses using a modified genetic algorithm and a modified artificial bee colony optimization method. The results of these modified algorithms are compared with those of the unmodified versions. The results demonstrate that the proposed new methods have better economic and environmental distribution performances. Accordingly, it can be concluded that the new methods are more effective and should be adopted. DOI : 10.26650/electrica.2018.49877Reliability and precision are very important in space, medical, and industrial robot control applications. Recently, researchers have tried to increase the reliability and precision of the robot control implementations. High precision calculation of inverse kinematic, color based object recognition, and parallel robot control based on field programmable gate arrays (FPGA) are combined in the proposed system. The precision of the inverse kinematic solution is improved using the coordinate rotation digital computer (CORDIC) algorithm based on double precision floating point number format. Red, green, and blue (RGB) color space is converted to hue saturation value (HSV) color space, which is more convenient for recognizing the object in different illuminations. Moreover, to realize a smooth operation of the robot arm, a parallel pulse width modulation (PWM) generator is designed. All applications are simulated, synthesized, and loaded in a single FPGA chip, so that the reliability requirement is met. The proposed method was tested with different objects, and the results prove that the proposed inverse kinematic calculations have high precision and the color based object recognition is quite successful in finding coordinates of the objects. DOI :10.5152/iujeee.2018.1820ECEbuntu is a free, easily distributable,customized operating system based on Ubuntu 12.04 long term support (LTS)designed for electrical/electronic and computer engineering (ECE) students.ECEbuntu is aimed at universities and students as it represents a cohesiveenvironment integrating more than 30 pre-installed software and packages allcatering to undergraduate coursework offered in ECE and Computer Science (CS)programs. ECEbuntu supports a wide range of tools for programming, circuitanalysis, printed circuit board design, mathematical and numerical analysis,network analysis, and RF and microwave transmitter design. ECEbuntu is free andeffective alternative to the existing costly and copyrighted software packages.ECEbuntu attempts to reduce the duplication of efforts on building softwareworkstations in laboratories and is intended to serve as a good teachingresource in a classroom setting. 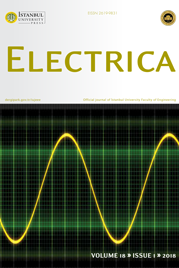 DOI : 10.5152/iujeee.2018.1821 Inthis paper, a 2.2 kW squirrel cage induction motor having different degrees ofstatic eccentricity is analyzed for fault detection using multi-resolutionwavelet analysis (MRWA). The reference squirrel cage induction motor wassimulated by using finite element method (FEM) and verified with the testresults for the reference. Multi-resolution wavelet analysis was applied todecompose the high frequency components of flux density and current of theinduction motor with different levels of eccenctricity. The effects of thesecomponents on the torque and vibration characteristics were also examined. Theresults show that MRWA could be a good alternative to fast fourier transform(FFT) in detecting air gap eccentricity in motors. DOI : 10.26650/electrica.2018.97856Melanocytic lesions are the main cause ofdeath from skin cancer, and early diagnosis is the key to decreasing themortality rate. This study assesses the role of input-vector encoding in neuralnetwork-based classification of melanocytic lesions in dermoscopy. Twelvedermoscopic measures from 200 melanocytic lesions are encoded by compactencoding, adrenocortical dysplasia (ACD) encoding, 1-of-N encoding, normalizedencoding, and raw encoding, resulting in five different input-vector sets.Feed-forward neural networks with one hidden layer and one output layer aredesigned with several neurons in the hidden layer, ranging from two totwenty-two for each type of input-vector set, to classify a melanocytic lesioninto common nevus, atypical nevus, and melanoma. Accordingly, 105 networks aredesigned and trained using supervised learning and then tested by performing a 10-foldcross validation. All the neural networks achieve high sensitivities,specificities, and accuracies in classification. However, the network withseven neurons in the hidden layer and raw encoded dermoscopic measures as theinput vector realizes the highest sensitivity (97.0%), specificity (98.1%), andaccuracy (98.0%). The practical use of the network can facilitate lesionclassification by retaining the needed expertise and minimizing diagnosticvariability among dermatologists. DOI : 10.26650/electrica.2018.02664From a system theory perspective, p53network dynamics is interesting since it can exhibit three dynamical modes ofp53, namely low-level equilibrium, oscillation, and high-level equilibrium.Each of these modes are associated with different cell fate outcomes: cellsurvival, cell cycle arrest, and apoptosis. The literature reveals that a highlevel (apoptosis) is seen only after ending the oscillation phase, so calledtwo-phase dynamics, which provides the decision of apoptosis depending on theoscillation duration. This paper proposes that a negative feedback can keeptime by counting the pulses of oscillation to take the decision of apoptosis orcell survival. P53DINP1, which is the mediator of this feedback, is added as avariable to a 2-D oscillator model of the p53 network. The resulting canonical3-D model successfully replicates the two-phase dynamics. That is, it possessestemporary oscillatory behavior, in which first oscillations (first phase) andthen high level state (second phase) are observed. By introducing a newvariable to the core oscillator in the p53 network, this study demonstratesthat p53 network can be considered a modular structure, which consists of anoscillator and other variables that control this oscillator to contribute tocell fate determination. DOI : 10.26650/electrica.2018.79181In this study, an artificial neural network (ANN) model-based self-tuning PID control method is proposed for the control of multi-input-multi-output (MIMO) nonlinear systems. A single layer, feed-forward ANN structure is trained via input and output data randomly collected from the system and classified as learning, test, and validation data to obtain the system model. The obtained model is utilized in an adaptive PID control scheme in conjunction with two different optimization methods for PID tuning and control. Using this scheme, PID parameters can be tuned to their optimum values and the system can be controlled simultaneously. The performance of the proposed method is demonstrated via experimental studies. DOI : 10.26650/electrica.2018.65047This study investigates the performance of a cognitive amplify-and-forward (AF) relay network over composite asymmetric multipath/shadowing fading channels, whereby a new power allocation method is adopted at the secondary source and relay, assuming the mean-value interference channel. To quantify the performance of the proposed structure, closed-form outage probability and ergodic capacity expressions are derived. Moreover, asymptotic ergodic capacity analysis is performed to observe the effects of limited feedback and fading/shadowing severity in the system. The analytical results are validated with Monte-Carlo simulations, and they show that the proposed structure can be a realistic scenario for next-generation wireless systems, and a system designer can test the overall performance of the proposed system without dealing with complex prototypes. DOI : 10.26650/electrica.2018.03405Continuous monitoring of respiratory rate (cycle) during sleep for diseases such as sleep apnea and sudden infant death syndrome (SIDS) can be lifesaving. Wireless radio communications signals are everywhere and can be harnessed for contactless monitoring of the respiratory rates. The amplitude of the received signal strength changes periodically depending on the exhalation and inhalation of the subject. In this paper, subspace-based multiple signal classification (MUSIC) algorithm is applied to estimate the respiratory rate for better results. The proposed method and the other power spectral density (PSD) methods for respiratory estimations are compared with the real laboratory measurements. It is demonstrated that the proposed method estimates the respiratory rate with high accuracy and outperforms the other PSD-based methods which are commonly used in the literature. DOI : 10.5152/iujeee.2018.1818ADSS (All dielectric self supporting) cables are generally installed on high voltage transmission lines and mostly used under different environmental effects, such as temperature, wind, UV radiation, etc. In this study, wind affect on ADSS cables was investigated by using dry band arcing (IEEE 1222 Electrical surface degradation) test method. A wind source was implemented to the test setup to evaluate the performance of PE (Poly-ethylene) cable jacket on ADSS cable under different wind speeds. Test results indicate that life time of the ADSS cable decreases while the wind speed is increasing. DOI : 10.26650/electrica.2018.99255Chronic kidney disease is a rising health problem and involves conditions that decrease the efficiency of renal functions and that damage the kidneys. Chronic kidney disease may be detected with several classification techniques, and these have been classiﬁed using various features and classiﬁer combinations. In this study, we applied seven different classifiers (Naïve Bayes, HoeffdingTree, RandomTree, REPTree, Random Subspaces, Adaboost, and IBk) for the diagnosis of chronic kidney disease. The classiﬁcation performances are evaluated with five different performance metrics, i.e., accuracy, kappa, mean absolute error (MAE), root mean square error (RMSE), and F measures. Considering the classification performance analyses of these methods, six reduced features provide a better and more rapid classiﬁcation performance. Seven individual classiﬁers are applied to the six features and the best results are obtained using individual random tree and IBk classiﬁers. DOI : 10.26650/electrica.2018.03052DC-DC converters control has gained muchattention because of their broad uses in various fields, ranging from hand-heldcalculators to sophisticated airborne vehicles. Robustness in control systems,in spite of parametric variations, is an absolute requirement in many such applications.We propose a new controller to realize a robust performance despite theuncertainties on system parameter values. The controller employs an adaptivenon-singular finite-time synergetic control method to tackle disturbances,which enhances the robustness and enables better performance during thetransient phase compared to the terminal sliding mode control. A finite-timeconvergence is therefore achieved, while Lyapunov synthesis guaranteesstability. Extensive simulation results of the DC-DC converter under harshoperating conditions confirm the effectiveness of the proposed controller. DOI : 10.26650/electrica.2018.02248In this paper, simple approximate formulasare established to estimate active and reactive power losses in distributionnetworks. The developed formulas based on load profiles are derived fromElgerd’s power loss formulas. A simple model is also proposed to estimate theload profile while considering several parameters, such as the average loaddemand and the load limitations. Derivation of the load model and the lossformulas are presented along with their applications on two distributionnetworks. The results show that the loss formulas, which depend on the proposedload profile, can estimate the power losses in distribution networks with highprecision. DOI : 10.26650/electrica.2018.36247This paper describes a novel approach for reducing the processing time of the histogram probabilistic multi-hypothesis tracker (H-PMHT) algorithm in video applications. Video data of flying vehicles is taken from surface to air, and a temporal difference-based technique is applied to video frames for meeting the intensity demands of H-PMHT algorithm. This technique also enables discrimination between objects and eliminates clutter. Variations between the structures of the standard and the improved version of H-PMHT algorithms are described. In addition, the improved H-PMPT is compared with the standard H-PMHT and another approved tracking algorithm to evaluate the performance and processing time reduction ratings.